Jehoshaphat makes a league with Ahab. (1-14) Micaiah predicts the death of Ahab. (15-28) Death of Ahab. (29-40) Jehoshaphat's good reign over Judah. (41-50) Ahaziah's evil reign over Israel. (51-53)1-14 The same easiness of temper, which betrays some godly persons into friendship with the declared enemies of religion, renders it very dangerous to them. They will be drawn to wink at and countenance such conduct and conversation as they ought to protest against with abhorrence. Whithersoever a good man goes, he ought to take his religion with him, and not be ashamed to own it when he is with those who have no regard for it. Jehoshaphat had not left behind him, at Jerusalem, his affection and reverence for the word of the Lord, but avowed it, and endeavoured to bring it into Ahab's court. And Ahab's prophets, to please Jehoshaphat, made use of the name of Jehovah: to please Ahab, they said, Go up. But the false prophets cannot so mimic the true, but that he who has spiritual senses exercised, can discern the fallacy. One faithful prophet of the Lord was worth them all. Wordly men have in all ages been alike absurd in their views of religion. They would have the preacher fit his doctrine to the fashion of the times, and the taste of the hearers, and yet to add. Thus saith the Lord, to words that men would put into their mouths. They are ready to cry out against a man as rude and foolish, who scruples thus to try to secure his own interests, and to deceive others. 15-28 The greatest kindness we can do to one that is going in a dangerous way, is, to tell him of his danger. To leave the hardened criminal without excuse, and to give a useful lesson to others, Micaiah related his vision. This matter is represented after the manner of men: we are not to imagine that God is ever put upon new counsels; or that he needs to consult with angels, or any creature, about the methods he should take; or that he is the author of sin, or the cause of any man's telling or believing a lie. Micaiah returned not the blow of Zedekiah, yet, since he boasted of the Spirit, as those commonly do that know least of the Holy Spirit's operations, the true prophet left him to be convinced of his error by the event. Those that will not have their mistakes set right in time, by the word of God, will be undeceived, when it is too late, by the judgments of God. We should be ashamed of what we call trials, were we to consider what the servants of God have endured. Yet it will be well, if freedom from trouble prove not more hurtful to us; we are more easily allured and bribed into unfaithfulness and conformity to the world, than driven to them. 29-40 Ahab basely intended to betray Johoshaphat to danger, that he might secure himself. See what they get that join with wicked men. How can it be expected that he should be true to his friend, who has been false to his God! He had said in compliment to Ahab, I am as thou art, and now he was indeed taken for him. Those that associate with evil-doers, are in danger of sharing in their plagues. By Jehoshaphat's deliverance, God let him know, that though he was displeased with him, yet he had not deserted him. God is a friend that will not fail us when other friends do. Let no man think to hide himself from God's judgment. God directed the arrow to hit Ahab; those cannot escape with life, whom God has doomed to death. Ahab lived long enough to see part of Micaiah's prophecy accomplished. He had time to feel himself die; with what horror must he have thought upon the wickedness he had committed! 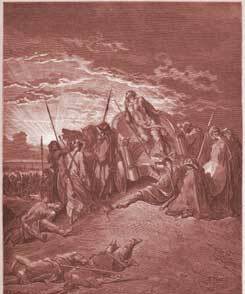 41-50 Jehoshaphat's reign appears to have been one of the best, both as to piety and prosperity. He pleased God, and God blessed him. 51-53 Ahaziah's reign was very short, not two years; some sinners God makes quick work with. A very bad character is given of him; he listened not to instruction, took no warning, but followed the example of his wicked father, and the counsel of his more wicked mother, Jezebel, who was still living. Miserable are the children who not only derive a sinful nature from their parents, but are taught by them to increase it; and most unhappy parents are they, that help to damn their children's souls. Hardened sinners rush forward, unawed and unmoved, in the ways from which others before them have been driven into everlasting misery. V. 16 Father, help me to proclaim boldly the gospel of Your Son that You have entrusted to us. Verse 14~Micaiah was going to speak the truth no matter what. He had God's approval for this. @LeeAnne-What about Romans 12:19-Dearly beloved, avenge not yourselves, but rather give place unto wrath: for it is written, Vengeance is mine; I will repay, saith the Lord. Ahab should have known that to obey is better than sacrifice. He had all the evidence for years to obey the Living God. He paid dearly for despising the Word of God. Hi LeeAnne; The Bible has many, many Scriptures which say that God does all these things. Jesus Himself said, that we should not be afraid of them that kill the body, but afterwards have no more power to hurt us; but that WE SHOULD FEAR HIM who after He has killed, has power to cast into hell. It also says that God looks for an occasion to take it up with His enemies, and sends their delusions. The Old Testament can be confusing since those writing it didn't fully understand the adversary and his ways the way we can understand today. All references to GOD bringing evil is a figure of speech since GOD is love and GOD is light and in HIM is no darkness at all. The figure of speech is a Hebrew idiom of GOD giving permission for evil to do as it pleases because of mans freewill to do evil. Milan, I believe the scriptures are implying that a demon or the devil who's nature and job it's to lie for Satan is the father of all lies John 8:44. Just as Satan appeared before God for permission to try Job it appears the same happened here an evil spirit volunteered for what they love to do be a lying spirit to Ahab the King. Glory be to God in the highest Amen! God is the Author and Finisher beginning and ending of all things. God has a purpose. Somewhere it also says that God is not the author of confusion yet it was God that confused the tongue at Tower of Babbel. Then he brought the tongue back together at pentecost which was his purpose. What is Lying to you and i is cleansed by the divine order of his purpose. What Yahweh cleans is truly cleaned. Truly. Verse 20 And the Lord said, Who shall persuade Ahab, that he may go up and die at Ramoth at Gilead. To clear up all confusion, verse 21 and there came forth a spirit, and stood before the Lord, and said, I will persuade him. I believe that Micaiah came forth and told the Lord he would go forth and be that lying spirit in the mouth of all the king s prophets. The Lord said, Thou shalt persuade him, and prevail also. 22 The Lord said go forth and do so. When the prophets did as the Lord allowed, verse 24 Zedekiah walked up to Micaiah and slapped him. He asked Micaiah do you think the Lord would speak to you and not to me? Micaiah replied, thou shalt see in the day when you shall hind thyself in the inner chamber. Ahab had Micaiah put in jail. Verse 16 and the king said unto him, how many times shall I adjure the that thou tell me nothing but that which is true in the name of the Lord? The Lord does not lie but will allow one thru a willing vessel that He choose. Consult the Lord 1st, Jehoshaphat king of Judah did. CRHarris. this has great life learning, their may be others ' but this speaks the "GOD remembrance of him ". What Do You Think of 1 Kings 22?